Un Ipod c'est super pratique, c'est super desgin mais depuis peu on a apprit que ca peut meme sauver une vie. (...) Kevin Garrad (3rd Infantry Division) was on a street patrol in Iraq (Tikrit I believe) and as he rounded the corner of a building an armed (AK-47) insurgent came from the other side.The two of them were within just a few feet of each other when they opened fire. 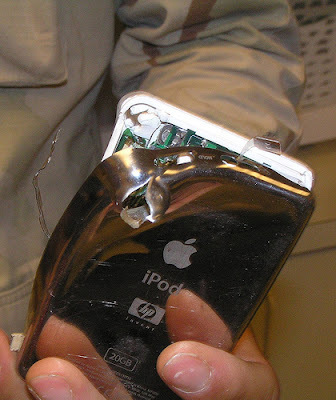 The insurgent was killed and Kevin was hit in the left chest where his IPod was in his jacket pocket. It slowed the bullet down enough that it did not completely penetrate his body armor. Fortunately, Kevin suffered no wound.